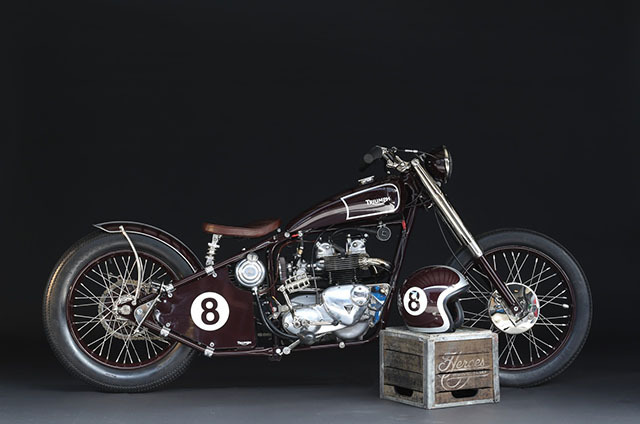 If I’ve learnt anything from my time here at Pipeburn, it’s that a custom bike does not need to be in your face to get your attention. 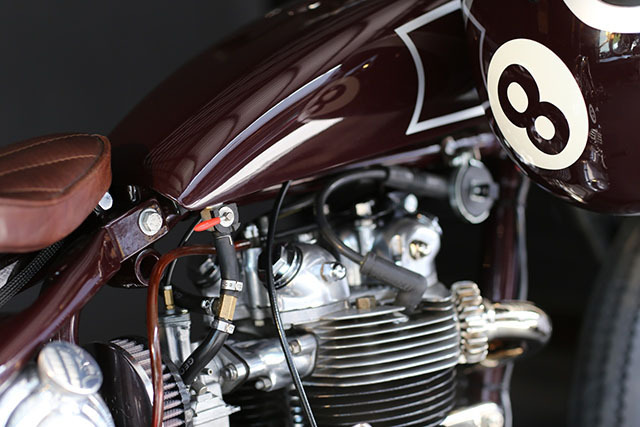 A clean build, with flowing lines and an attention to detail, will create just as much of a stir as a full-blown hyper colour super custom machine. That’s definitely the aim of today’s feature bike. 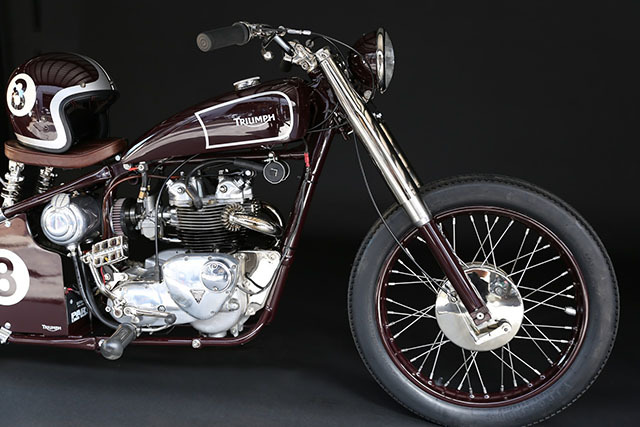 Simplicity itself, this 1968 Triumph T100 bobber has been streamlined and lightened to achieve the look desired in the build, while still retaining functionality with the ability to easily kick-start the vertical twin and put some miles down on the Tarmac. 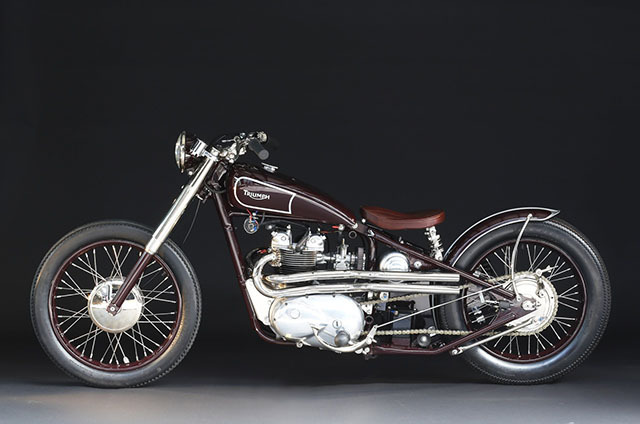 Built by Serge Bueno of Heroes Motorcycles in Los Angeles, the Triumph has benefitted from the 20 years Serge has spent rebuilding classic bikes in France; check out their site and you can see this bike is definitely not the first machine Serge has laid spanners on. 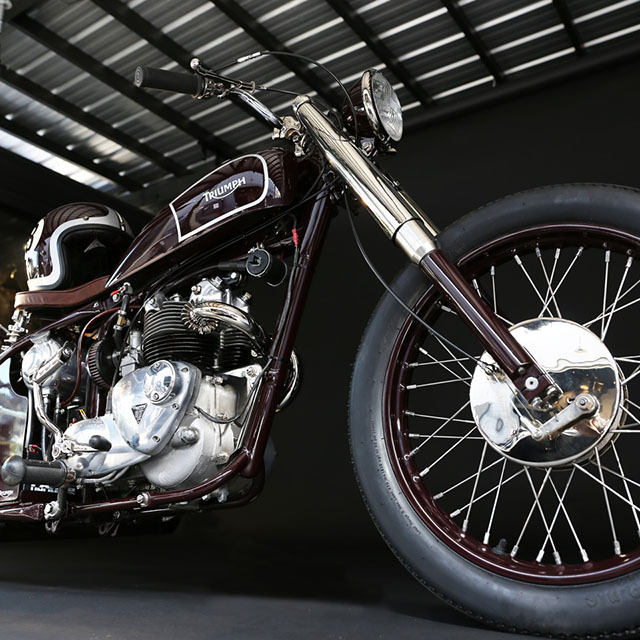 With all the work done in-house, from the front to the back this bobber is pure Bueno, and the work is sweet. With a ‘chic spirit in a racing body’ the target, the frame has been detabbed and decluttered. 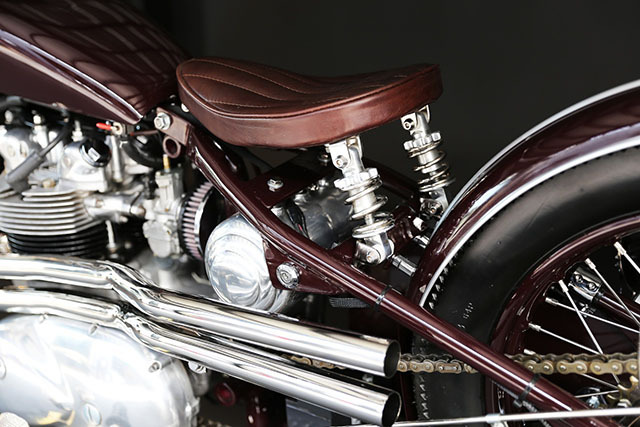 The factory bulbous fuel tank has been discarded, with a specially moulded fibreglass tank designed to make the lines of the bike flow back over that sweet leather seat, suspended by two 4 inch mini shocks. 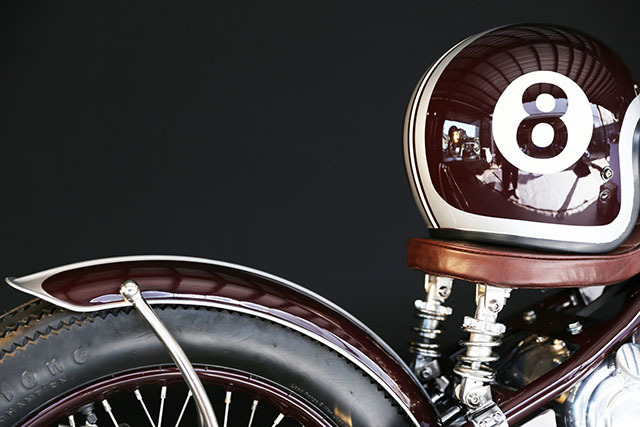 At the rear of the low slung machine, a plate has been fabricated into the frame, to feature a racing number to add to the racing body of the bike. 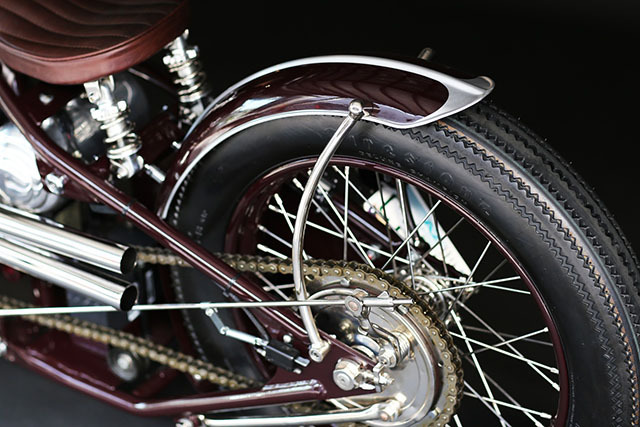 The front guard has been deleted during the build, the rear guard bobbed neatly and hugging the rear tire. 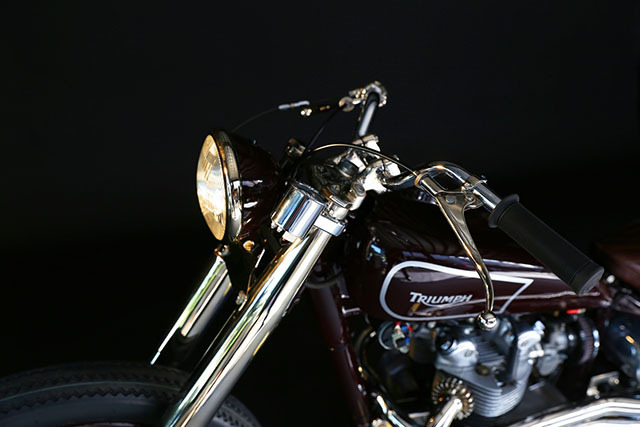 Adding to the list of custom componentry, a set of scrambler pipes have been fashioned up and mounted on the bike, finishing up just aft of that beautiful seat. Pod filters are now fitted, along with new spark plug leads and ignition coil. 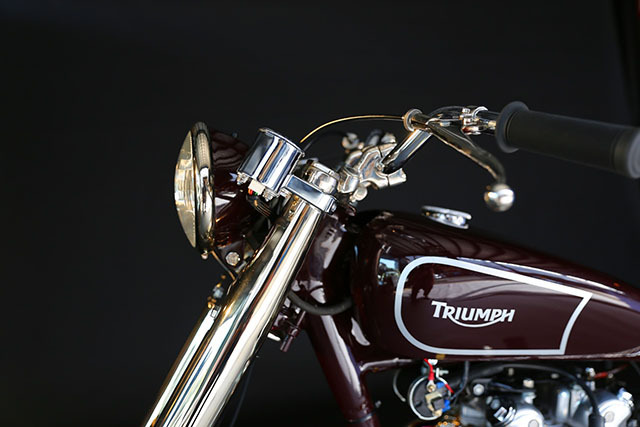 A fresh oil tank now adorns the centre of the frame, and the engine block has been polished to high heaven. Like I said before, a bike doesn’t have to shout to get your attention, sometimes it’s better to talk quietly and carry a big racing number on your flank.